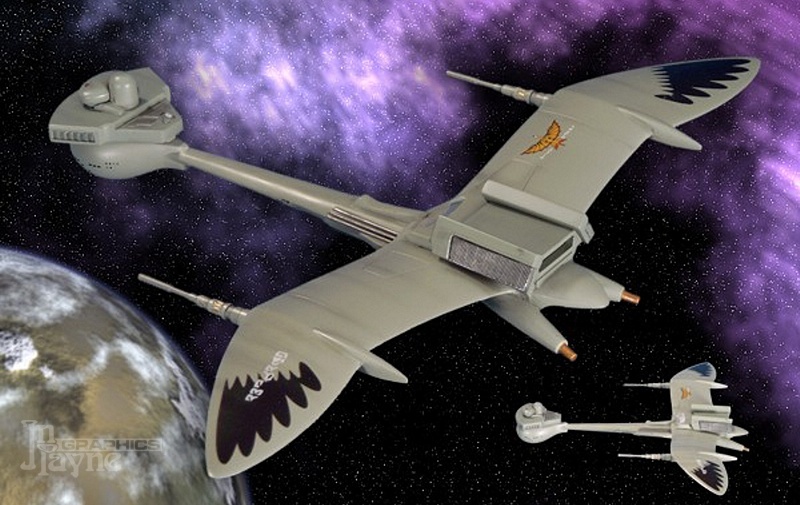 Virtually unknown to Federation personnel, the Romulan "Seabird" class attack cruiser is generally used to patrol subject worlds within the boundaries of the Romulan Empire. 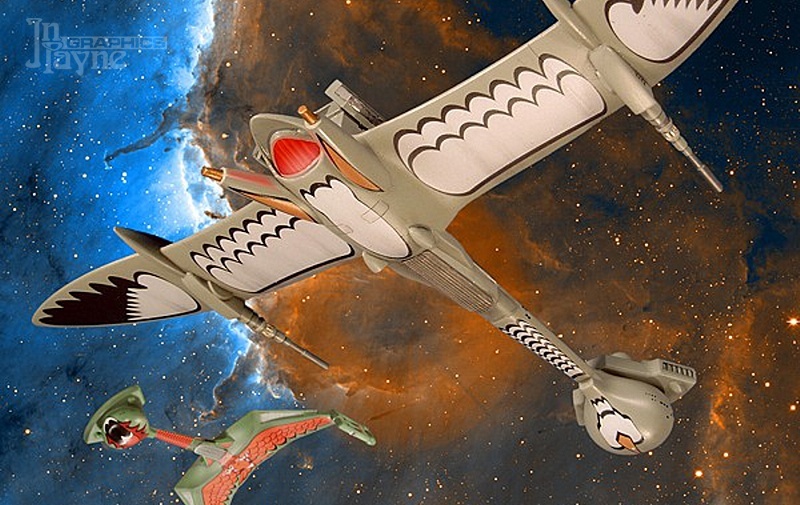 Named for the birds that line the seashores of Romulus - comperable to Terran gulls - considered vicious scavengers in Romulan culture. The ship's beautiful eliptical wings are an indulgence of artistic shipwrights, unnecessary for spaceflight, but useful for mounting weapons. Break and attack! The Seabird's enormous disruptor cannons brook little argument from seditious subjects. Rebellion is rare in the Empire, partly thanks to these potent warships. 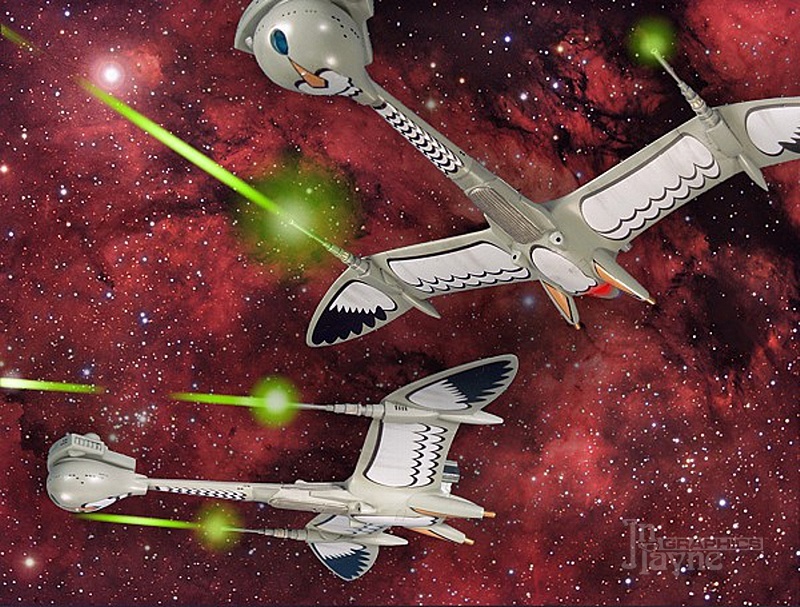 As is traditional in the Romulan fleet, a stylized bird motif is painted on the ships' bellies, in the case of the Seabird, the pattern evokes the class namesake, conveying the image of the hovering scavenger, ready to swoop down on dissenting populations, symbolically implying that they are already as good as dead. Deep space rendezvous. A Seabird meets with a fleet command battle cruiser, itself in full plumage, to exchange personnel. Seabirds normally patrol in pairs, but lone ships are useful for clandestine missions. They do not routinely carry a cloaking device, but can be easily retrofitted with one. Smaller than the classic, borrowed Klingon design despite the identical forward sections, Seabirds ship light crews of less than 100. The aft hull is almost entirely occupied by the newly designed warp drive (an early deveolpment of that used by the later Klingon B'Rel class Bird of Prey), and the ship's crew is housed exclusively in the bulbous forward hull. The Seabird's two ungainly "feet" are presumed to be a field stabilizing component of the new warp drive. Starfleet intelligence analysts refer to them unkindly as "the drumsticks."